Buy two, get free shipping! FilterWater.com Alkalizing SMART Multi Stage Cartridge 10"x2.5" offers latest technologies in water purification. Can be used in place of our 6-stage Cartridge. From several blends of High Quality Granular Carbon, ion exchange resins, Redox media , this filter can perform miracles with water. Fits most systems that use standard 10"x2.5" cartridges. 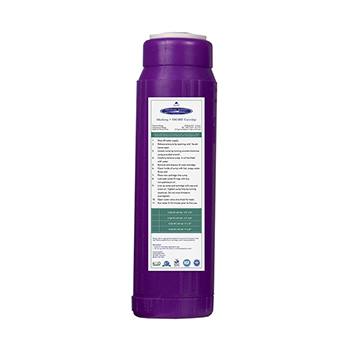 Granular Activated Carbon media removes chlorine and reduces taste and odors. Catalytic Carbon removes chloramines and its by-products linked to caner such as TTHMs, pesticides, herbicides , insecticides , Volatile Organic Compounds (VOCs), PCBs, MTBEs and several hundred of other contaminants that can be present in water. Eagle Redox Alloy mix reduces heavy metals such as lead and aluminum. Ion exchange media reduces hardness. Alkalizing media blend is designed to polish final results and produce top quality drinking water from a single cartridge. Blend includes the natural minerals of magnesium oxide and calcium oxide, which is non-hazardous, environmentally friendly, safe and a cost-effective treatment for alkalinity. Our white ceramic spheres, which use adsorption for impurities and heavy metals, also aid in human metabolism and natural healing. Tourmaline and infra-red spheres are used to drive the alkalinity higher. Can be used in counter top and under sink systems. Approximate replacement interval 1 year or 500 gallons at 0.5 gpm (0.5 gallon per minute or 1.9 liter/min flow).